Welcome to NM EPSCoR's Archived Website! New Mexico’s Experimental Program to Stimulate Competitive Research (NM EPSCoR) is a multi-faceted program aimed at improving New Mexico’s capacity to carry out scientific research. 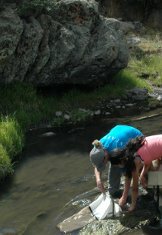 Funded by the National Science Foundation, the current project focuses on science research into the impacts of climate change on Northern New Mexico water resources by investing in the state's research infrastructure, cyber-infrastructure, and human infrastructure. As a result of NM EPSCoR's investments, New Mexico's meteorological and hydrological observational network is now on a par with other Western States. We have provided information and education about climate change science to thousands of New Mexicans and have taken a leadership role in developing computational interoperability standards that allow for wider use and sharing of climate data. NM EPSCoR has worked to increase the diversity of NM's science-related workforce and provided new research experiences to undergraduate students across the state. About NM EPSCoR: Our mission and vision, information about project personnel and highlights of project achievements. Science: Information about each of the research components, including photos of researchers in action. Education & Outreach: Educational programs and resources for K-12 teachers and students, undergraduate students, graduate students, faculty, and the public. For Researchers: Links and resources for NM EPSCoR researchers and project personnel. New Mexico EPSCoR Program is funded in part by the National Science Foundation award #0814449 and the State of New Mexico. Any opinions, findings, conclusions, or recommendations expressed in the material are those of the author(s) and do not necessarily reflect the views of the National Science Foundation.